Bixi Goes Bankrupt; What Happens Next? A row of Bixis stood waiting for lunchtime riders in Montreal last fall. 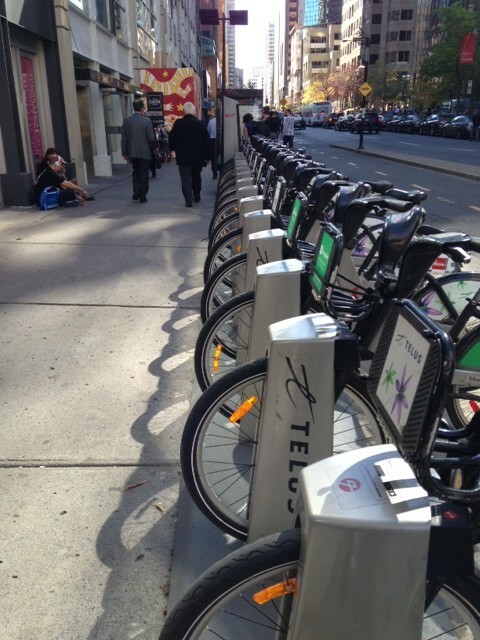 Will Bixi be back? The shock wave traveled across the bicycling community on social media Monday afternoon, when the word came out of Montreal: Bixi, the big name in bike sharing, had filed for bankruptcy protection. Andy Riga, the Montreal Gazette‘s ace transportation reporter, was all over the story (read his coverage here). The city of Montreal essentially forced Bixi into Canada’s version of Chapter 11 protection, basically in order to give the troubled company a chance to restructure $50 million in debt. Bixi, in fact, is owed $5.6 million by New York and Chicago, which have refused to make payments because of recurrent problems with Bixi-operated software. Comments Off on Bixi Goes Bankrupt; What Happens Next?